One designated Sunday each month “volunteers” count all the birds on eight stretches of coastline on Arran. This is done at Brodick, Lamlash, Whiting Bay, Kildonan, Blackwaterfoot, Machrie, Pirnmill and Lochranza. The birds counted include familiar birds like Mallard and Oystercatcher and less familiar birds like Common Scoter and Greenshank. In 2014 a total of thirty five species were recorded. These volunteers are part of a bigger group of volunteers who are continuing a tradition begun in 1947, Last year around 3,000 volunteer counters took part in synchronised monthly counts at wetlands of all habitat types throughout the UK, mainly during the winter period. This national survey provides information on the size of waterbird populations, the trends in numbers and the importance of individual sites. 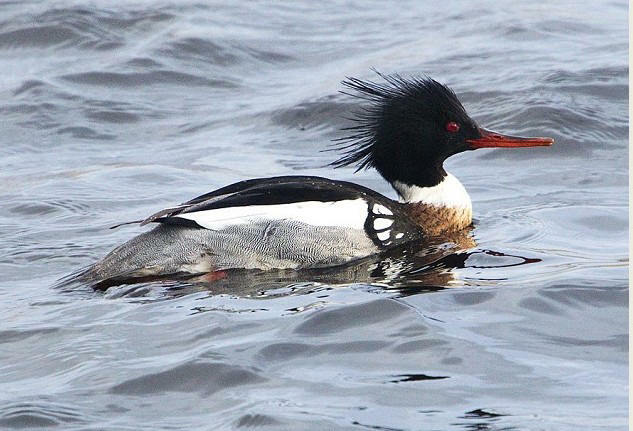 For example, from the information collected Arran is a site of national importance for Red-breasted Merganser. The survey is called the Wetland Bird Survey (WeBS) and it is a partnership between leading conservation bodies in the UK, namely the British Trust for Ornithology, the Royal Society for the Protection of Birds and the Joint Nature Conservation Committee (the last on behalf of the statutory nature conservation bodies: Natural England, Natural Resources Wales and Scottish Natural Heritage and the Department of the Environment Northern Ireland ), inwith the Wildfowl and Wetlands Trust. Why? The UK is of outstanding international importance for waterbirds. Lying on some of the major flyways for Arctic-nesting species, large numbers of waterbirds are attracted, especially during winter, by the relatively mild climate and extensive areas of wetland, notably estuaries. The UK thus has both moral and legal obligations to conserve both the waterbirds and the wetlands upon which they depend. Legal obligation? Yes the UK has ratified a number of international agreements which require, among other things, that sites and habitats for migratory waterbirds are identified, protected and managed appropriately, Signatures to the agreement specifically are required to monitor waterbird populations.